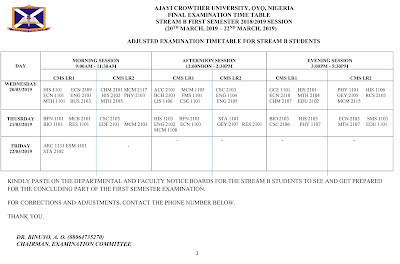 Ajayi Crowther University (ACU) Adjusted Examination Time-Table Schedule for First Semester, 2018/2019 Academic Session [Stream B Students]. This is to inform all students of the Ajayi Crowther University (ACU) that the rest of the First Semester examinations for Batch B Stream students will commence on 20th March, 2019 and end on 22nd March, 2019. Recommended: Ajayi Crowther University Guidelines for Preparation & Conduct of Semester Exams. 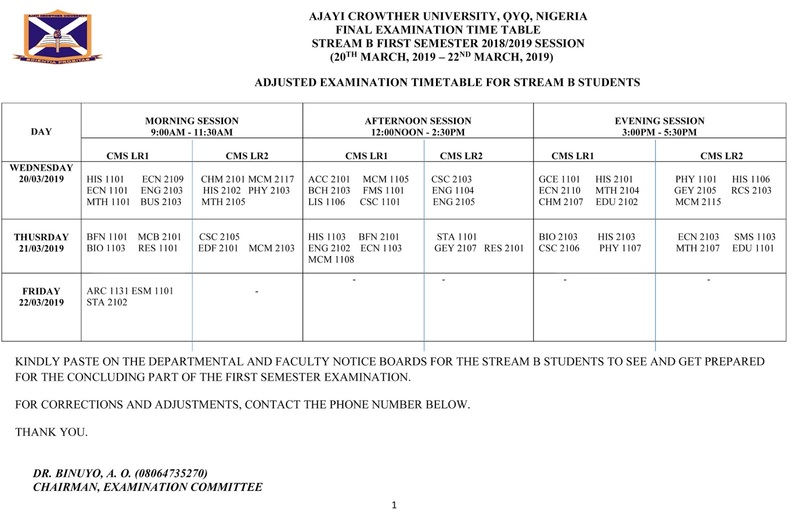 Ajayi Crowther University Adjusted First Semester Exam Timetable 2018/2019 [Stream B] | 1st Semester.